ADU Services are here to help you to prepare for bidding and construction of your ADU, the way you want it, when you are ready and without commitment! How can I get my ADU built? Our ADU Services and ADU Marketplace provide the fastest and lowest cost way to get started with your ADU project. How does it work? Get started on your project with expert assistance and without commitment using our customized ADU Property and Design Reports as your first step. Then, get on-site visits from local contractors who can provide you with guidance and estimates for your ADU project. ADU Property Report provides fast zoning, feasibility and cost analysis to help you evaluate your options for an ADU on your property in a single report. Typically $120 to $200 per property. We call your city planning department to confirm your property's ADU requirements. Written analysis of the feasibility for an ADU on your property. 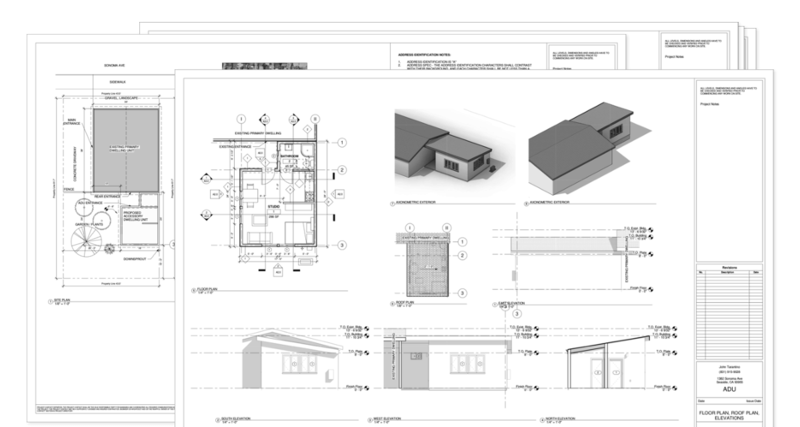 Confirmation of allowable ADU designs including garage conversion, modular and two stories. Objective estimates for permit fees, construction costs and property taxes. Summary of potential risks and uncertainties for your project. Records and notes from each contact to city offices for your reference. Suggestions for design concepts, next steps and expected timelines for the project. Delivered within 3-5 business days from your date of order. Scheduled follow up call with our team to answer any questions you have. With your ADU Property Report, you'll be well prepared to decide what the best next step is to move your ADU project forward. Check your property and verify ownership to get a price quote. Typically $250 to $500 per property. All information provided in ADU Property Report is included in ADU Design Report. Preliminary ADU design intake questionnaire. ADU designs customized to your property & selections. ADU design types supported: attached, detached, conversion, 1 & 2 stories, modular. 3-4 custom ADU design concepts provided per report. Modeled 3D concepts (exterior & interior models, including all existing structures). Preliminary site plan layouts for each concept. Delivered within 10 business days from your date of order. 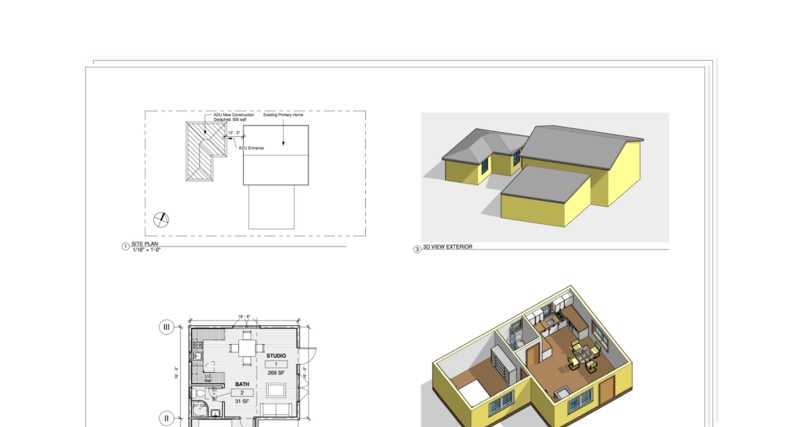 With your ADU Design Report, you'll be well prepared to begin drafting construction drawings, permitting and sourcing estimates from local contractors to move forward with your ADU project. ADU Permit Set provides complete construction plans ("blueprints") customized for your ADU project and the requirements for your city, ready to submit for permit. Typically $1,500 to $2,500 per project. Proposed ADU floor plans and elevations. Foundation, framing & structural plans. Electrical, plumbing and mechanical plans. Title 24 energy code certification report. * ADU Design Report required for final price quote, typical price range of $1,250 to $2,250 per project. ** Services for requirements not included in your ADU Permit Set may be sourced through Hausable or directly from providers on an as required basis. Pricing for such services is determined by third party providers and Hausable does not mark up such services. *** This service is only available for order once an ADU Design Report has been performed for the property. Pricing will be calculated depending on the requirements, style, location and complexity of the design. Not all properties will be offered this option, particularly if the report determines that, for example, variances are likely to be required for project approval, or requirements for the ADU project are substantially more customized than a standard residential design. With your ADU Permit Set, you or your contractor will be fully prepared to submit your project for permitting at your city. We'll continue to update the plans as the city requires in order to reach approval of your project. Then verify ownership to get more information about your property's ADU potential and get quotes for ADU Services.